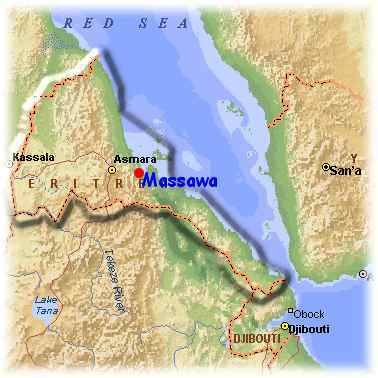 Massawa, Eritrea was the first port of entry for us in the Red Sea. We were impressed by the friendliness and efficiency of the Immigration and Customs officials. town of Keren was one of the highlights of our cruise up the Red Sea. Check-In - These are the procedures we followed in 2003 to follow to check into Eritrea. Call on channel 16 when you are about 1 mile outside the Massawa port entrance. You will be instructed to either tie up along the jetty or allowed to proceed directly to the anchorage, which was the case for us. It is a long dingy ride back to the jetty, but we did not fancy tying up to the concrete jetty wall. Bring ship's papers, passports, clearance from last port of call and crew list to the Immigration office first. It would be wise to dress in a conservative and respectful manner (long pants for men or women and covered shoulders for the women)when dealing with the officials as we found, without fail, that we were always treated well and respectful also. The immigration official will review your passport and issue you a shore pass, which you must show to get in/out of the port area. They will retain your passport until you leave. The shore pass allows you to roam freely around the town of Massawa but does not allow you to travel inland. If you wish to go to Asmara, you can apply for a visa at the Immigration office. The visa costs us about $50 US and allowed us to stay for 3 months and travel all over the country. You then exchange your shore pass for your passport with visa stamp which you must show the guard when leaving/entering the port area. Proceed to Port Captain's office. Check-out - These are the procedures that you follow to check out. Bring boat along side of the jetty and tie up. Proceed to immigration office to either exchange your shore pass for your passport or have an exit stamp put in the passport. Proceed to Port Captain's office to get your port clearance.